Eastern end of Rajghat, Benares. bl.uk > Online Gallery Home	> Online exhibitions	> Asia, Pacific and Africa Collections	> Eastern end of Rajghat, Benares. 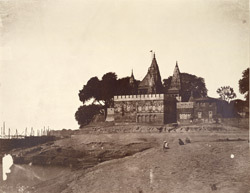 Photograph of the Rajghat in Varanasi from 'Murray Collection: Views in Delhi, Cawnpore, Allahabad and Benares' taken by Dr. John Murray in 1858 after the Uprising of 1857. Rajghat is located on the eastern end of the Ganges river near the Dufferin Bridge crossing. Beyond the ghat there is a plateau which is believed to be the original location of the city centre. Hindus regard the Ganges as amrita, the elixir of life, which brings purity to the living and salvation to the dead. Those who die at Varanasi are considered extremely fortunate and blessed for they attain release from samsara, the unceasing cycle of death and rebirth, and are assured of moksha or enlightenment. The dead person’s family brings the body down from the city on a bamboo stretcher covered in a red or white cloth, following with chants and prayers. The body is dipped into the Ganges and put on a funeral pyre lit by the eldest son or a close relative from an eternal flame which is kept burning on the ghat. Burning the body is a way of offering it to Agni, the god of fire. The ashes are later scattered onto the river. The cremation ghats are presided over by the Doms.